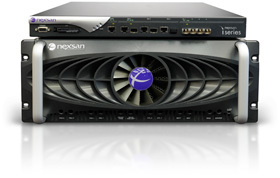 Nexsan iSeries™ is the perfect solution for server virtualization, databases, file storage, data consolidation and multiple data storage requirements where performance and scalability are a must and simple IP deployment is desired.All storage services are embedded onto the Nexsan iSeries including virtualization, snapshots, replication, mirroring, data migration and more. Users have the ability to create and control 1000s of virtual volumes supporting multiple applications and storage pools simultaneously.By reliably incorporating SAS and SATA in the same storage system, users no longer have to choose between a performance or capacity driven iSCSI SAN system. Separate storage pools can be created for the needs of different applications from databases to backup.With an all-inclusive Tier 1 feature set combined with industry leading performance, reliability and energy efficiency, Nexsan iSeries is delivering the iSCSI SAN you need…at a price to meet your budget.